A gold medal day for the snow shoeing trek through the Hibou Conservation Area this past Sunday. Well, perhaps not Olympic level in the afternoon event sponsored by Friends of Hibou in the wooded trails on the east side of the Harbor just north of Owen Sound. But great spirits and fun for the intrepid 13 who reveled in the brilliant sun but froze a little in the sharp northerly winds. Chris Hachey lead us from the parking lot at the pumping station into the west side of the park, around the circular trail with side trips onto the beach and shore ice. Lots of birds in sight, especially around the feeders. We did make a short side trip up the east side trail. This is an invitation to the members of Friends of Hibou and of the Sydenham Bruce Trail and your friends. Please come out for a snow shoe hike and enjoy this beautiful piece of property so close to Owen Sound. Head out of Owen Sound on 3rd Ave East and proceed toward Leith on Grey Road 15. Where: Meet at the south parking lot of Hibou Conversation Area. Length: for about 1 to 1.5 hrs depending on conditions. Jake invites you back to his house just south of the Conservation Area for warm drinks and cookies after the hike. RSVP. Please phone or email Jake if you plan to attend. 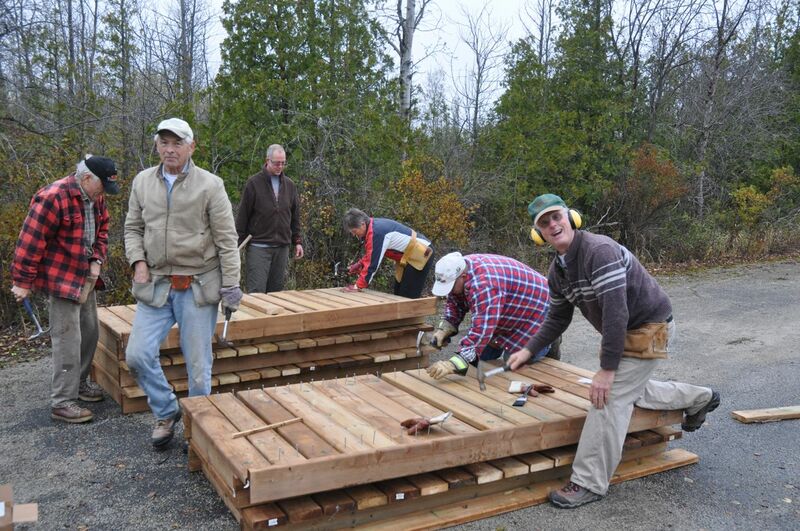 Following a week of rain and two days of cold sun, we were lucky to have cloudy, dry warm day to bring a group of 11 workers together to construct the 25 eight-foot boardwalks for the wet part of the trail. Three hard working teams managed to complete the task by just after noon. What a group! Those of us who love to use the trails are grateful for your time and effort in making this happen. 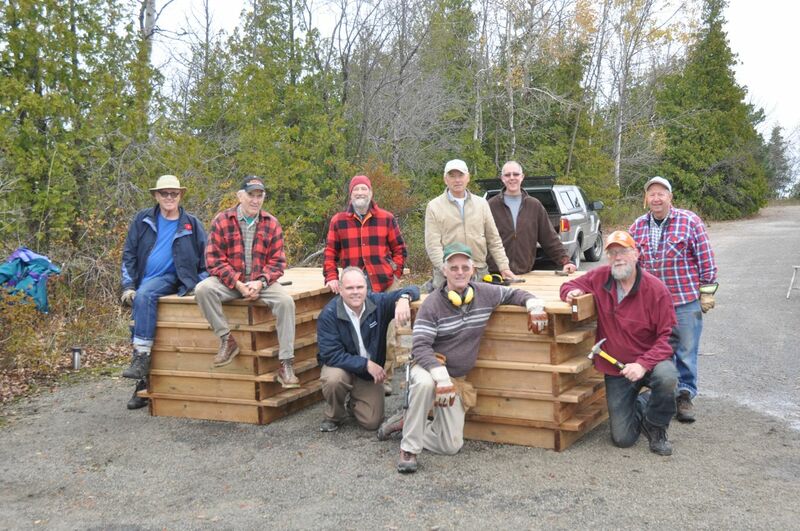 Thanks also to TD Canada Trust and their environmental funding for the purchase of the wood. We are definitely off to a great start in making the trails more user friendly. Soon you will see new signage with maps identifying “You Are Here.” at specific points along the trail. As you may be aware, the Friends of Hibou has received a $4000 grant from TD Canada Trust Environmental Fund to build a boardwalk at Hibou through the Grey Sauble Conservation Authority. The building materials will be delivered to Hibou Park on Monday Oct 28 in readiness to begin building on Wednesday. When: 9am till 4pm on Wednesday Oct 30, Thursday Oct 31 costume optional), and Friday Nov 1st. Where to meet: Hibou park by the garage in the beach parking Lot. Construction: The boardwalk will be built in 8 foot sections using precut 2×6’s. It should go quickly. Assembly: This will take place by putting sections on a block and using a screw gun to connect boardwalk pieces. What to bring: warm clothes, hammer, gloves, ear protection (optional), Lunch if staying all day, drinking water. 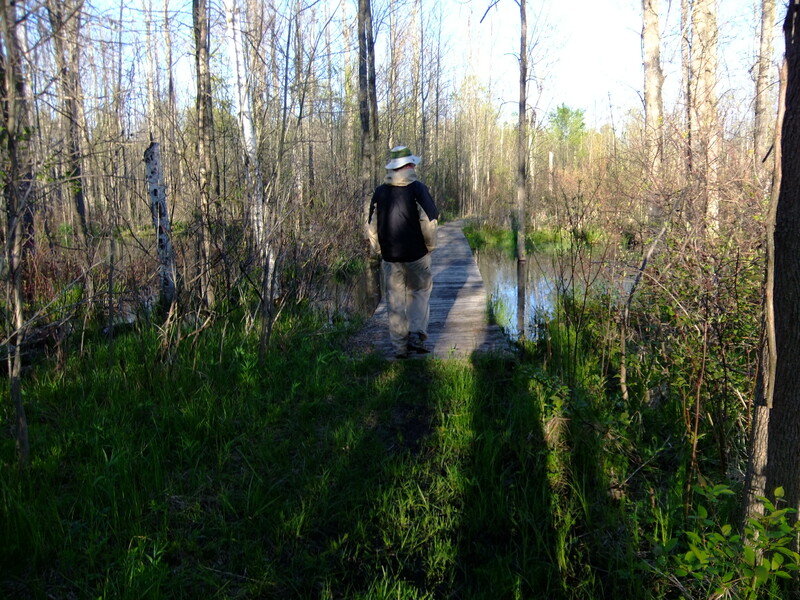 Note: If it is too wet to move the board walk along the trail we will have to store them at Hibou until the trail is more dry. • Note: work will only take place on Nov 1st if we have been able to move the boardwalk to the trail site. We hope you will join us for the Oct 5th Hike and Geocache for Conservation at Hibou Conservation Area. Click on the links at the bottom for poster and pledge form. 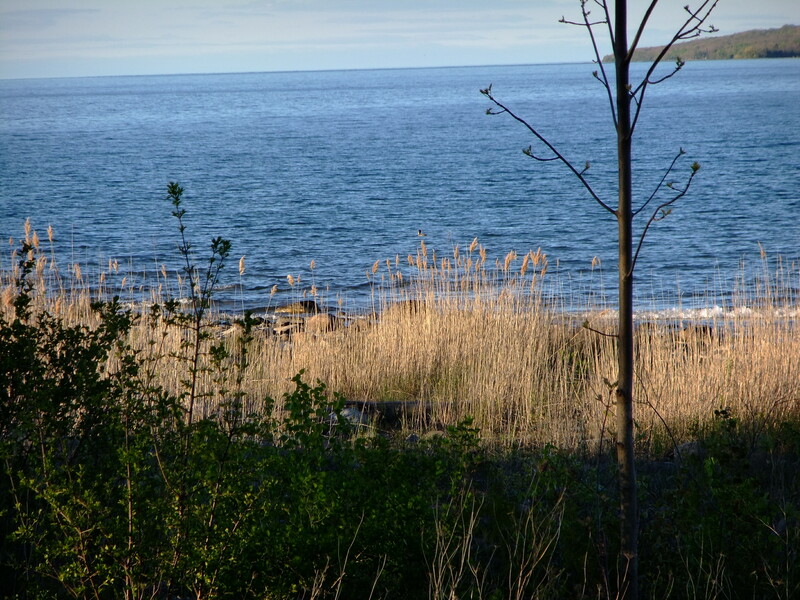 Participants will gather at the Hibou pavilion for a CITO event with a goal to clean-up the debris along the east shoreline. Garbage bags and gloves will be supplied. Prizes will be awarded! 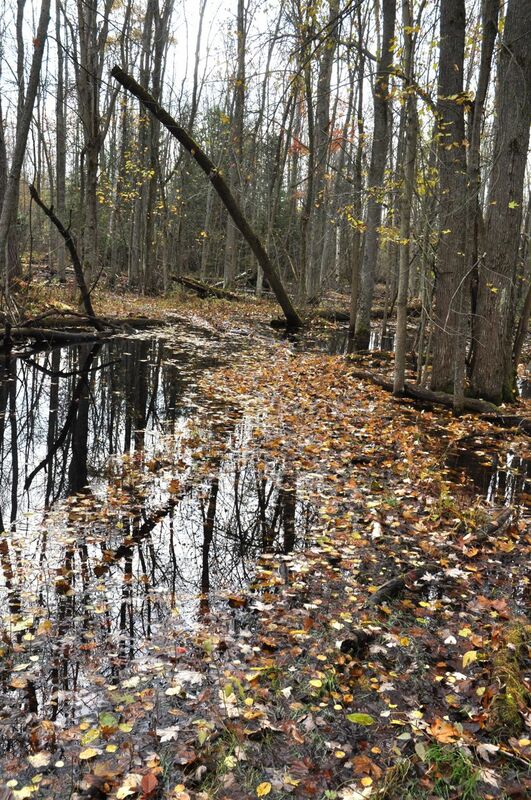 3km hike – Gather some pledges and join the guided hike that will explore the history and natural heritage of Hibou Conservation Area. Learn about Geocaching along the way and help discover some hidden caches. All proceeds benefit local conservation projects. Geocaching – Geocaching is a real-world, outdoor treasure hunting game using GPS-enabled devices. Players navigate to a specific set of GPS coordinates and then attempt to find the geocache (container) hidden at that location. This event will appeal to geocachers looking to find the newly established caches at Hibou. Please share this with your friends who may also be interested. The links below will give you the poster to share and the pledge form. an evening hike of the Hibou Trails. We would like to show you all the trails if time and weather permit. We will include the boardwalk area on the east side of the road as well as the forest loop on the west side and some of the shoreline. There are so many options to shorten your route and return to your car early if you wish. Everything is fairly close to the road. The total trails are around 5 to 6 Km if we do them all. Bob Knapp will share some information he knows of the history and nature as we go..
Meet us at the south parking lot, on the right as you enter the park along East Bayshore Road from Owen Sound. Please share this message with your hiking friends and colleagues. About 5-6 km in total. Shorter options will be possible. on the right as you enter the park along East Bayshore Road from Owen Sound.